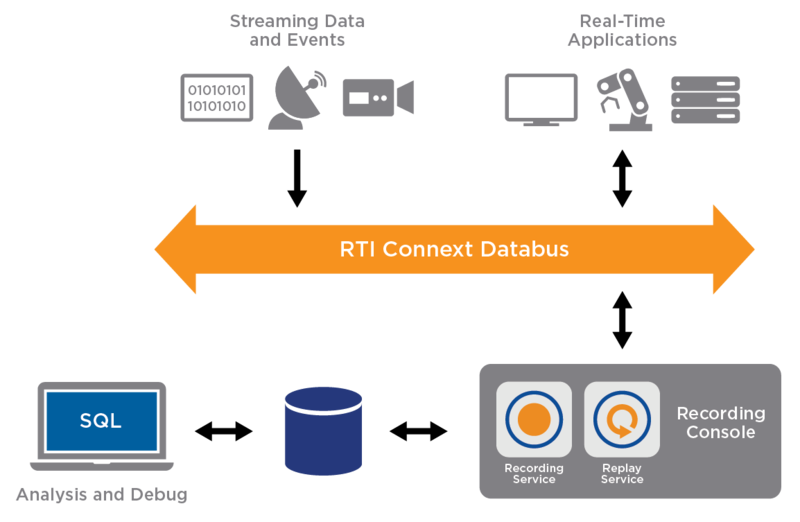 RTI Recording Service is the first off-the-shelf solution for reliable and non-intrusive recording, analysis and replay of real-time data, messages and events at high data rates and high fidelity. Data is stored in a portable format, immediately available for replay, query, conversion to commonly accepted formats and export to data analysis tools. Recording Service is operating system and programming language agnostic. You can choose to record data using best effort or reliable communications depending on your application requirement and data sensitivity. You can replay the recorded data, which can be stored in serialized or deserialized form, using RTI Recording Console. Or use the Replay tool directly if you want to tie the replay service into your software or infrastructure. When replayed, data will be published just like the original Connext DDS application did. That means you can use the original domain ID, QoS settings and data rate. But you can also change the data rates or QoS settings for testing different scenarios or experimenting with various options. Recording Service is particularly relevant for systems that rapidly generate large volumes of real time data, such as in combat and transportation management. It is also useful for testing and simulation, intelligence, surveillance and reconnaissance (ISR) systems.